Who Should I Ask for Help? For hundreds of years, Florence has remained a perpetual fountain of creativity and intellectual thought. The city is bursting with architectural and artistic masterpieces waiting to be explored. In addition, you’ll find a city that’s fast becoming an international hub for European politics, business, and international education. Expect to be deeply engaged with your studies and host culture. Site visits within Florence and field trips throughout Italy and beyond are integral to the academic program, and your homestay will round out both your personal and educational experience. Consider supplementing your academic program with one of over 50 internship opportunities . To get a feel for what life is like on campus, check out the Syracuse Florence site . This program is for students who wish to take all of their courses at Syracuse University’s Center in Florence. It offers Italian language courses at the beginner, intermediate, and advanced levels, along with a broad selection of courses taught in English. Most students choose this option. 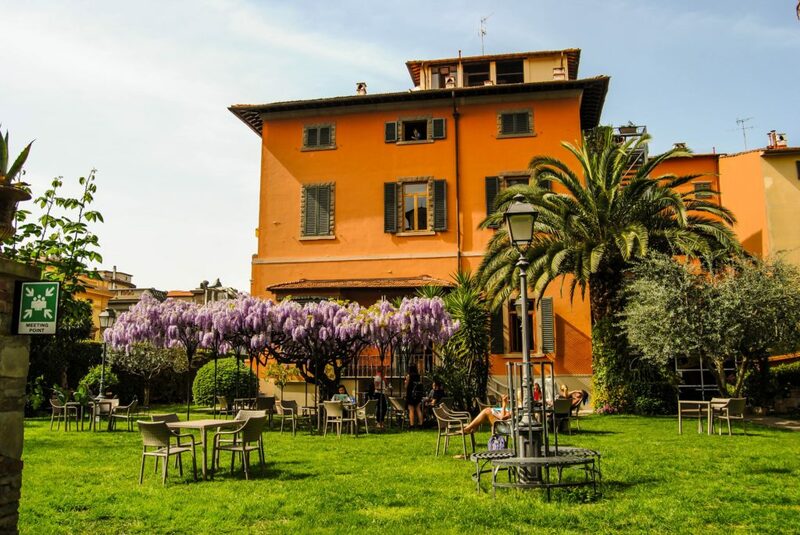 Take your Italian language classes at the Centro di Cultura per Stranieri (part of the University of Florence), located just across the Piazza from the Syracuse Florence Center. The Centro hosts students from around the globe, allowing you to interact with students from all over the world while studying Italian language and culture. This program offers full cultural and academic immersion for students who would like to study alongside Italian students in selected courses at the University of Florence. Courses are instructed in Italian and offered in a wide range of disciplines. The Syracuse Florence architecture program is designed for undergraduate students enrolled in a professional architecture program who have completed five semesters of design studio, either at Syracuse University or another school. This program is designed for studio art majors or minors, offering studio classes in disciplines including (but not limited to) painting, drawing, ceramics, and photography. Studio arts students typically enroll in 2-3 studio classes, Italian language, and one other elective course at the Syracuse Center. (Spring only) This program is open to second-year students in aerospace, chemical, civil, environmental, and mechanical engineering programs. Courses offered cover most engineering and math requirements for sophomore spring semester in aerospace, chemical, civil, environmental, and mechanical engineering programs. (Spring only) Students in a variety of creative majors are invited to apply to participate in the Syracuse Florence design program. This program offers participants the opportunity to take courses in collaborative design and contemporary design history, complemented by studio and academic electives. (Fall only) The course schedule at the University of Florence (UniFi) includes a variety of courses in economics and political science offered in English, which provides an exciting opportunity for Syracuse Florence Center students who are not proficient in Italian language to take a class with Italian students. These classes will meet at UniFi, an approximate 20-30 minute one-way commute from the Syracuse campus. The Graduate School of Syracuse University and the Department of Art and Music Histories conduct a one-of-a-kind M.A. program devoted to studying Renaissance art in Florence. It offers highly motivated students a unique opportunity to carry out advanced research, including first-hand examination of art, architecture, and urban settings. Already at the master’s level, students make original contributions to the field: they collaborate in a research project and present the results of their study at the annual Symposium in Florence. Candidates first apply through the Syracuse University Graduate School and are screened and ranked by the Department of Art and Music Histories’ Graduate Committee. Once you are on campus for the first, Syracuse-based semester, you will apply through Syracuse Abroad to go to Florence. Talk to recent Syracuse Florence students! The best way to understand what to expect in Florence is to talk to someone who has already participated in the program. Florence global ambassadors took part in school field trips, found the best gelato in the city, and immersed themselves in Italian life with their host families – ask them about Florence! 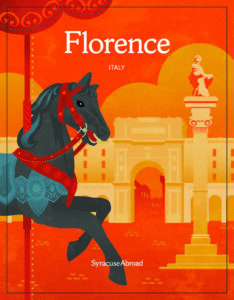 An overview of the Syracuse Florence program is available in our viewbook [PDF, 1MB]! Request a copy of your own by filling out this form to have one mailed to you!